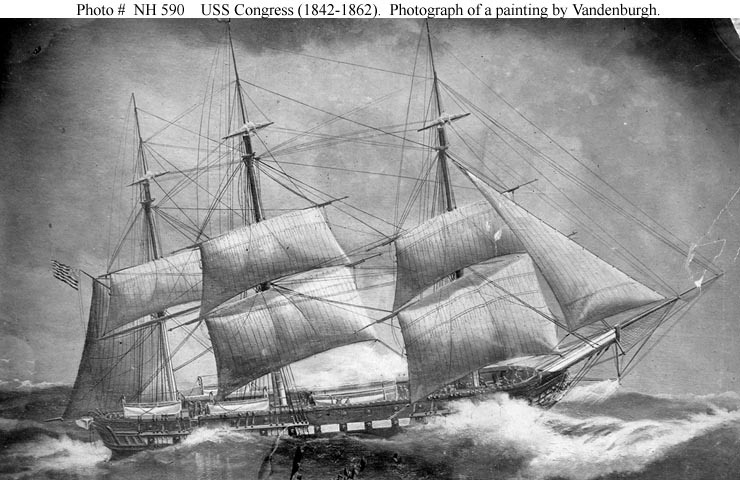 USS Congress, a 1,867-ton sailing frigate, was built between 1839 and 1842 at the Portsmouth Navy Yard, Kittery, Maine. Commissioned in May 1842, she made a Mediterranean cruise in that year and into 1843, then served off the South American east coast until early 1845. After a refit, she was sent to become flagship of the Pacific Squadron, remaining there until mid-1848. During that cruise, Congress took an active role in the war with Mexico. From June 1850 until June 1853, the frigate served as flagship of the Brazil Squadron. Congress next deployed to the Mediterranean Sea for two years' duty as flagship, beginning in June 1855 and concluding in November 1857. On her next assignment, from 1859 until mid-1861, she was again the Brazil Squadron flagship. The outbreak of the Civil War brought Congress back to U.S. waters, where she spent her remaining days. She joined the blockade of the Confederacy's Atlantic coast in September 1861. On 8 March 1862, while anchored off Newport News, Virginia, USS Congress was attacked by the ironclad CSS Virginia (CSS Virginia destroys USS Cumberland and USS Congress). After suffering heavy casualties in a one-sided action with a opponent that was virtually invulnerable to her guns, the veteran frigate was forced to surrender. She was subsequently destroyed by fire and the explosion of her powder magazine. The real reason to own this oversize book, however, is for the images: more than 200 of them, including dozens of contemporary photographs of the vessels that fought to preserve the Union. There are maps and portraits, too; this fine collection of pictures brings vividness to its subject that can't be found elsewhere. Its one great battle in the spring of 1862 marked the obsolescence of wooden fighting ships and may have saved the Union. Its terrible end in a winter storm off Cape Hatteras condemned sixteen sailors to a watery grave. And the recovery of its 200-ton turret in August 2002 capped the largest, most complex and hazardous ocean salvage operation in history. In Ironclad, Paul Clancy interweaves these stories so skillfully that the cries of drowning Union sailors sound a ghostly undertone to the cough of diesel generators and the clanging of compression-chamber doors on a huge recovery barge. The din and screech of cannonballs on iron plating echo beneath the hum of electronic monitors and the garbled voices of Navy divers working at the edge of human technology and endurance in water 240 feet deep. Clancy studied the letters and diaries of the Monitor's long-ago sailors, and he moved among the salvage divers and archaeologists in the summer of 2002. John L. Worden, captain of the Monitor, strides from these pages no less vividly than the remarkable Bobbie Scholley, the woman commander of 160 Navy divers on an extreme mission. Clancy writes history as it really happens, the improbable conjunction of personalities, ideas, circumstances, and chance. The Union navy desperately needed an answer to the Confederacy's ironclad dreadnought, and the brilliantly eccentric Swedish engineer John Ericsson had one. And 140 years later, when marine archaeologists despaired of recovering any part of the Monitor before it disintegrated, a few visionaries in the U.S. Navy saw an opportunity to resurrect their deep-water saturation diving program. From the breakneck pace of Monitor's conception, birth, and brief career, to the years of careful planning and perilous labor involved in her recovery, Ironclad tells a compelling tale of technological revolution, wartime heroism, undersea adventure, and forensic science. This book is must-reading for anyone interested in Civil War and naval history, diving and underwater salvage, or adventures at sea. Perhaps more importantly, Roberts also provides an invaluable framework for understanding and analyzing military-industrial relations, an insightful commentary on the military acquisition process, and a cautionary tale on the perils of the pursuit of perfection and personal recognition." - Robert Angevine, Journal of Military History "Roberts's study, illuminating on many fronts, is a welcome addition to our understanding of the Union's industrial mobilization during the Civil War and its inadvertent effects on the postwar U.S. Navy." - William M. McBride, Technology and Culture"
Combining technical, personal, administrative, and literary analysis, Mindell examines the experience of the men aboard the Monitor and their reactions to the thrills and dangers that accompanied the new machine. The invention surrounded men with iron and threatened their heroism, their self-image as warriors, even their lives. Mindell also examines responses to this strange new warship by Nathaniel Hawthorne and Herman Melville, who prophetically saw in the Civil War a portent of the mechanized warfare of the future. The story of the Monitor shows how technology changes not only the tools but also the very experience of combat, generating effects that are still felt today in the era of "smart bombs" and push-button wars. "We find new significance in the otherwise well-known history of the Monitor. It is no longer the story of the heroic inventor and his impenetrable weapon thrusting themselves upon a doubtful and conservative bureaucracy... It is no longer the story of a heroic battle and the machine's epic loss soon after. Rather it is a story of people experiencing new machinery, attempting to make sense of its thrills, constrictions, and politics, and sensing its power and impotence -- both in glory and frustration." -- from War, Technology, and Experience aboard the USS Monitor. About the Author: David A. Mindell is Dibner Associate Professor of the History of Engineering and Manufacturing in the Program in Science, Technology, and Society at MIT. He has degrees in Electrical Engineering and Literature from Yale University and a Ph.D. in the History of Technology from MIT. His research interests include the history of military technology, the history of electronics and computing, and archaeology in the deep ocean. He is currently working on a history of feedback, control, and computing in the twentieth century, and on locating and imaging ancient shipwrecks and settlements in the deep regions of the Black Sea. Fully illustrated with cutting-edge digital artwork, rare photographs and first-person perspective gun sight views, this book allows the reader to discover the revolutionary and radically different designs of the two rival Ironclads - the CSS Virginia and USS Monitor - through an analysis of each ship's weaponry, ammunition and steerage. Compare the contrasting training of the crews and re-live the horrors of the battle at sea in a war which split a nation, communities and even families. About the Author: Ron Field is Head of History at the Cotswold School in Bourton-on-the-Water. He was awarded a Fulbright Scholarship in 1982 and taught history at Piedmont High School in California from 1982 to 1983. He was associate editor of the Confederate Historical Society of Great Britain, from 1983 to 1992. He is an internationally acknowledged expert on US Civil War military history, and was elected a Fellow of the Company of Military Historians, based in Washington, DC, in 2005. The author lives in Cheltenham, UK. Recommended Reading: Ironclad Down: USS Merrimack-CSS Virginia from Design to Destruction (Hardcover). Description: The result of more than fifteen years of research, Ironclad Down is a treasure trove of detailed information about one of history s most famous vessels. Describing the fascinating people--Stephen Russell Mallory, John Mercer Brooke, John Luke Porter, et al.--who conceived, designed and built one of the world's first ironclads as well as describing the ship itself, Carl Park offers both the most thoroughly detailed, in-depth analysis to date of the actual architecture of the Virginia and a fascinating, colorful chapter of Civil War history.